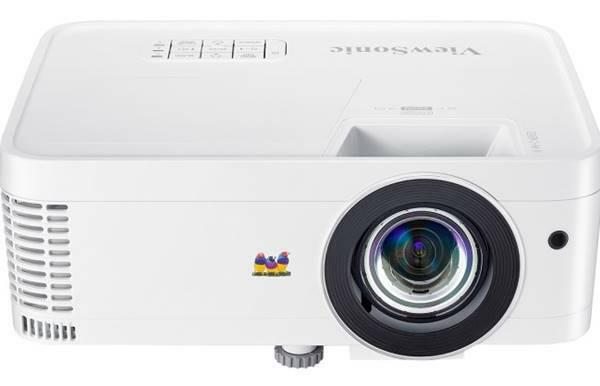 Viewsonic's newest 1080p projector, the Pro8520HD, is a big bright model designed for use in conference rooms, board rooms, and other business environments. Promising up to 5,000 lumens of brightness, the Pro8520HD is designed to be flexible and friendly, with a 1.5:1 zoom lens to help it fit into your room and a cornucopia of connectivity to get all of your devices hooked up. Its MSRP of $2,299 puts it right in the middle of the pack for this class of projector, but its image quality is good and its feature set is impressive, making it a strong value. In our dimly lit theater space, the Pro8520HD's light output overwhelmed the screen and did a fair job of lighting the entire room all by itself. After turning on some room lights, increasing the size of the image, and switching to Eco mode, we had a much more appropriate level of brightness. Our testing started out with some text documents, Excel spreadsheets, and text-based PowerPoint presentations. The Pro8520HD displays all of these crisply and clearly and maintains sharpness from edge to edge, with no trace of softness in the projector's 1080p image. All of the projector's image modes did an excellent job with these types of material. Color performance, on the other hand, varies. The Viewsonic Pro8520HD is a single-chip DLP projector optimized for high light output, which means two things: one, it has a color wheel that is not solely RGB, and two, it makes heavy use of BrilliantColor to boost white light output. Image modes like Brightest and Standard emphasize white light output at the expense of colored light output, so color-rich content like photos and video tend to look out-of-balance, with over-bright highlights and poor color saturation. To get satisfying performance for these types of content, you can switch to either the Theater or Dark Room modes, which cut light output but have much better color saturation and overall image balance. Perhaps the most surprising application for the Pro8520HD is gaming. While the Pro8520HD is not a gaming projector, it is bright, high resolution, has fairly accurate color in Theater and Dark Room modes, and measures just 10 milliseconds of input lag. These qualities make it a great choice for large-screen gaming use in a partially light-controlled environment, where the extra brightness gives the Pro8520HD an edge over products marketed for home theater. The Pro8520HD has a manual 1.5:1 zoom lens, which is a bit more reach than is typically seen on this class of projector. This zoom range allows the Pro8520HD to hit a 150" diagonal 16:9 screen from 15' 4" to 23' 4". The lack of lens shift, typical for this class of projector, means you'll need to esnure your installation is planned out properly. The Pro8520HD has a fixed throw offset of 32%, meaning the edge of the image (bottom edge for a table mount, top edge for a ceiling mount) is offset 32% of the image's height from the centerline of the projector's lens. On our 150" diagonal image, that's an offset of 24". The Pro8520HD has a full connection panel, with two HDMI inputs, two VGA inputs, a dedicated VGA monitor passthrough, audio in/out, and both wired and optional wireless networking. Most users will have more than enough ports to connect any device that's needed.